1. Pool Night is fun! Jump in the pool with your family and friends to play around while practicing your dive skills. 2. Pool Night is convenient. If your schedule is busy during the day, Pool Night allows you to come in after hours to practice before you trip. 3. Pool Night makes you safer! Test your gear, refresh your skills and swim around to tune your buoyancy so you are confident and safe on your trip. We have select dates available for you to practice your skills throughout the year. 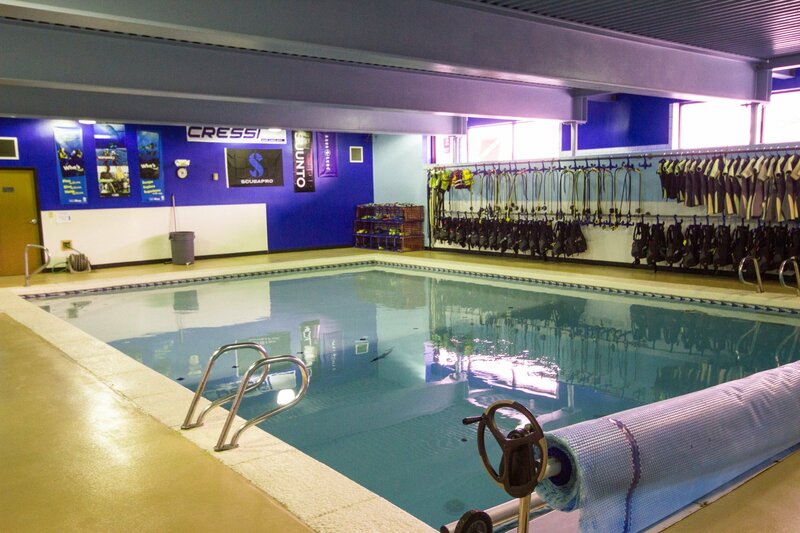 $25 covers your pool time, one rental tank and any scuba equipment you may need. Do our times conflict with your schedule? No problem! Call the store at 303-220-8282 to check our pool availability. *Pool Night is not a class, just unsupervised pool time for you to practice by yourself or with a dive buddy. You must be a certified diver to participate in Pool Night, and have been diving within the last 2 years. If it has been longer than 2 years since your last dive, you must take a scuba refresher course prior to using our pool unsupervised. Materials Included: No instructor is available for Pool Nite. We highly recommend bringing a buddy and working together.